Lodo Drum Guy is proud to partner with Legends Jazz Festival 2015 as its backline drum & percussion gear provider. Check it out tomorrow, 12/3, and Friday, 12/4, at Legend High School in Parker, CO. The music will be amazing as 30 bands perform and you'll get to hear my inventory in action. Space is limited. Event will be AWESOME!! Posted on December 6, 2015 by Pete and filed under Event and tagged Backline Legends Jazz Festival. Update: Vintage Ludwig Drums help New Belgium's Tour de Fat raise $100K in Denver!! As many of you know, when New Belgium's Tour de Fat needed to find a vintage, professional backline drum set out of all of Denver's used drum stores they could have called they turned to me!! Needless to say I was stoked! New Belgium needed a drum set that could live up to all the bemusement of their awesome stages and crazily costumed cyclists—one of the many cheap beginner drum sets I go through weekly wasn't gonna do the trick. I needed a special vintage kit to match all the vintage cycling moustaches that would look great on stage. New Belgium's cycling beer fanatic following is a well-dressed crew, just ask anyone who was at the costume contest. What drum set can live up to that? It's a perfect 1965 Ludwig Super Classic drum set in MINT condition and delivered it from Utah for an unbeatable price. These amazing sounding cans are wrapped in a beautiful champagne sparkle finish that stood up to Tour De Fat's amazing stage design. The '65 vintage Ludwig Super Classic set and congas that rounded out the backline for New Belgium's Tour De Fat in Denver's City Park. Tour De Fat's main stage and some of the fans and cyclists. In case you missed it, City Park was pretty full of cyclists and beer enthusiasts last weekend who helped raise more than $100,000 for charity marking Tour De Fat's most successful single-day draw to date. The event kicked off with a costumed bike parade from City Park, through Park Hill and back to the Tour De Fat's main stage. The event featured Portaoke (karaoke in a port-o-potty), music from bands like Jekyll, Wild High and In the Whale and tons of other bemusements. 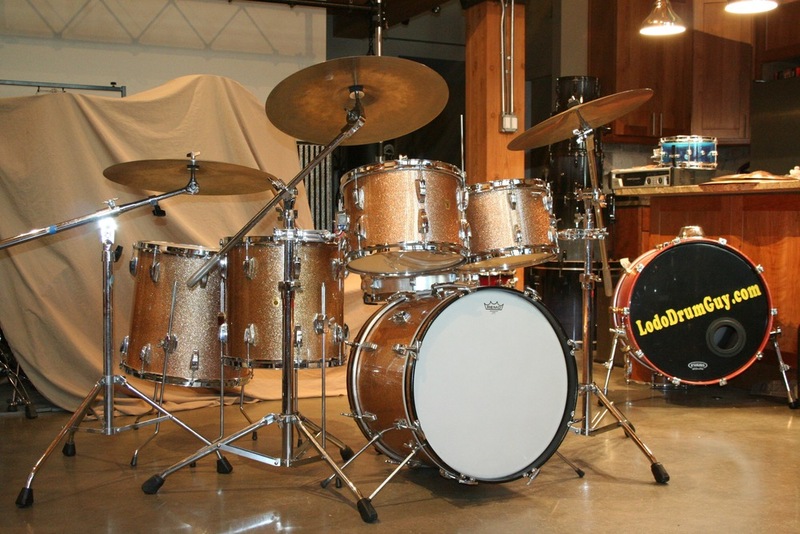 That Ludwig drum kit has since toured the country, bringing amazing vintage tone to all those that attend and giving those vintage Luddys the attention they deserve (they were found in the owner's garage, untouched for years). Thank you New Belgium, Fat Tire, and Tour de Fat for THAT!! I love helping people save money on awesome drum kits and cymbals, especially when the money they save goes to charity. I've got another upcoming fundraiser so make sure you're subscribed to my newsletter and blog feed. I don't say this often, but when I do, I mean it...AWESOME!! Posted on September 24, 2015 by Pete and filed under Event and tagged Ludwig Tour De Fat. I recently had the opportunity to hunt down an awesome vintage 1960's Ludwig drum kit for the Tour de Fat summer concert series put on by Colorado's own New Belgium Brewing. They asked me to keep a lookout for this awesome era of vintage Luddys to add a classic vintage drum tone to the back-line for their summer concert tour. I was stoked, but finding a 1960's era vintage Ludwig drum kit at an affordable price is not easy—collectors LOVE these drums for their warm sounding 3 ply mahogany/poplar/mahogany shells. These drums sell for top dollar on eBay with irrational exuberance even when they're in bad condition—vintage drum dealers often grab the unique tom brackets, bass spurs, drum mufflers and other hardware for restoration projects. A Champagne Sparkle Super Classic Ludwig drum set stamped May 1965 in damn-near new condition!! Front detail of this awesome set of Luddys in 2 up 2 down configuration. Back detail of the drum kit, in virtually mint condition. Featuring a vintage Ludwig snare drum, the 1960s era Acrolite. Detail of the '60s Ludwig tom hardware and drum badge. The original owner bought this drum kit (manufacture stamp May, 1965) and played it for a bit before meeting his wife. She custom-sewed drum cases for him out of denim and asked him to put his drums in storage since she hated the loud noise. He quit drumming and stored the drum kit for over 40 years when I bought them in like-new condition at an estate sale in Utah. They are truly mint. These Luddys have an amazing vintage tone that's got the warmth and darkness of poplar and mahogany. Although they don't project in the same way modern birch drums do the depth and quality of the tone is well worth it since it sounds less harsh. Vintage Ludwigs record and mic up especially well, sitting comfortably in the mix. Drum shells are 12˝ and 13˝ hanging toms, with 14˝ and 16˝ floor toms, and a huge-sounding but tiny 14˝ × 20˝ bass drum that glitter beautifully under stage lights. The '60s shells were painted white on the inside and have 1˝ solid reinforcement rings. Features classic 1960s knurled hardware and white felt baseball bat drum mufflers. I couldn't find a nicer set of vintage Ludwigs, but I still needed a snare drum and cymbals to round out the vintage drum tone for Tour de Fat. A vintage Ludwig aluminum Acrolite from the early 1960s. I added this snare from my personal stash and it sounds great. I also picked up a giant lot of vintage Zildjian cymbals and outfitted the kit with a set of vintage Zildjian A cymbals. 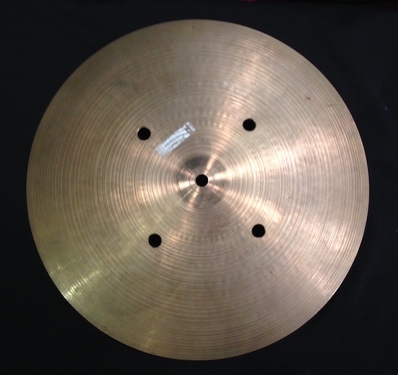 These cymbals, like vintage Ludwigs, feature a darker, warmer tone designed for the lower volumes of the 1960s. These warm tones sound great with mics on stage or recordings and are one of the reasons '60s records sound so great. I asked a buddy from Geffen what drum heads I should use and he recommended Remo coated heads. After slapping them on and tuning them up I delivered an awesome '60s drum kit in complete and perfect condition to Fat Tire. This awesome drum kit will be at Civic Center Park in Fort Collins on 9/5 and at City Park in Denver on 9/12 if you want to check it out for yourself. After that, it will be on tour throughout the summer with New Belgium's Tour De Fat. You can find more details about where to see the vintage Ludwigs on New Belgium's Tour de Fat site. Posted on May 27, 2015 by Pete and filed under Event and tagged Vintage Drum Kits Ludwig Tour De Fat.